A quick duplicate of the classic Sonic & Knuckles logo. Scribbled together as a CD cover commemorating the release of Project Chaos. Kirby hats for the new generation! Samus' hair lends Kirby a paralyzing laser pistol, and Pit's 'do allows him to wield the holy bow handed down by Palutena. 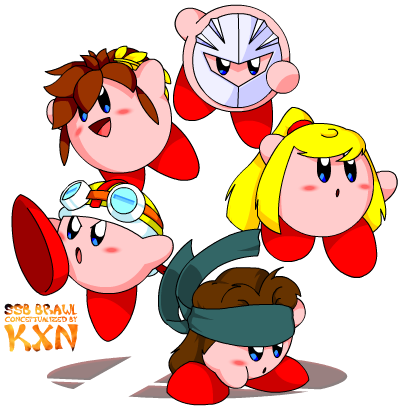 Meta Knight's mask lets Kirby create a tornado of sword slashes, and Snake's bandana gives him access to an arsenal of grenades! In a not very drastic change, Wario's bike helmet gives Kirby the ability to swallow incoming projectiles. 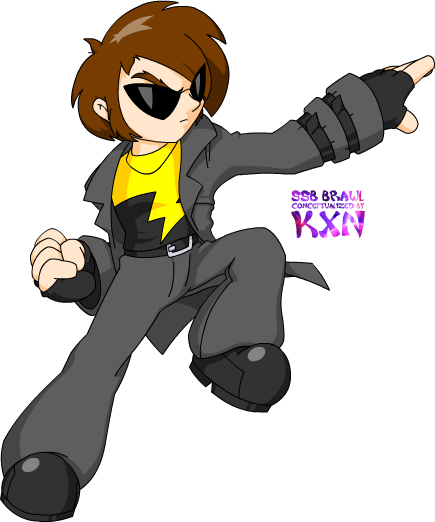 A Smash Bros. redesign of my own personal avatar, as he would appear if he were allowed to appear alongside Mario. Originally concepted as a joke, I later completed the piece for use in other projects, and because I took a liking to the re-design. 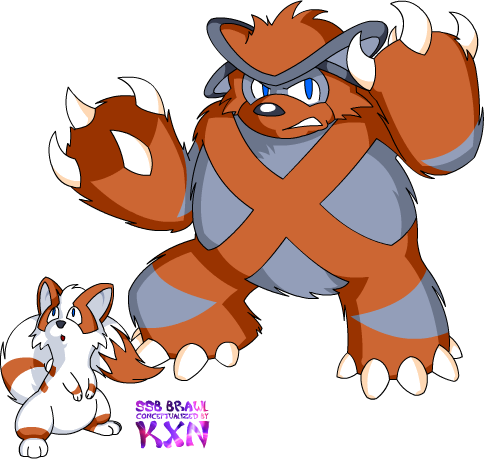 Wild Rakitty and Bearcoon appear! Fan art of good friends' Pokémon-spoofing series, done to commemorate his "animated comic book" pilot episode starring said characters. Rakitty and Bearcoon are © Bill Cass and Tasia Bozek. Challenger Approaching! 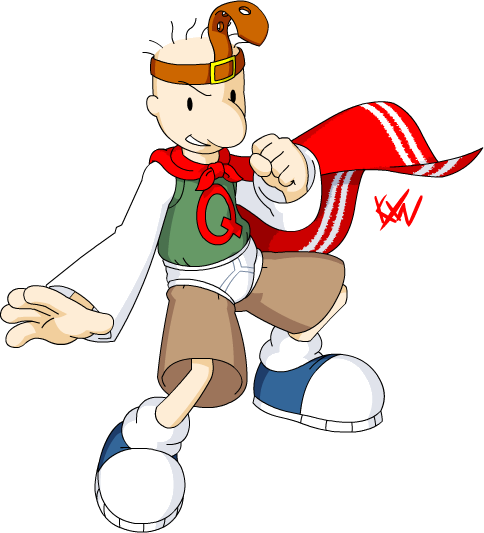 From the planet Bob, Quail-Man appears, wielding his powers of patience, intelligence and speed. He may not look like much, but his devastating Quail Eye will leave you helpless and stupified! A few weekends ago, while cleaning and packing things in preperation for the upcoming move, my mom found an entire unopened pack of construction paper. I scooped it up (along with a giant box of mostly unused crayons) to add to my collection of varying random art supplies. 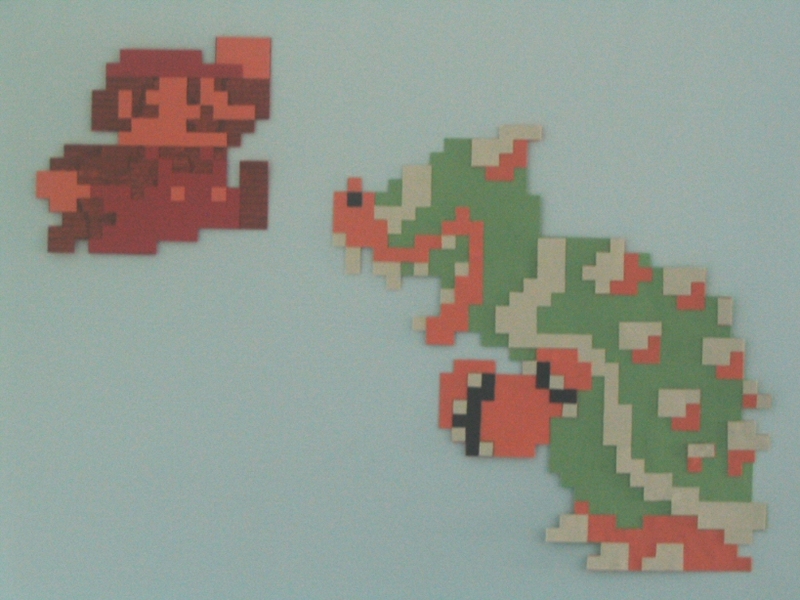 After a week or two at looking at it, I decided what it would be perfect for; a timeless remake of Mario and Bowser charging into battle. The first in a robot master project that I started but unfortunately cut short only four in. One of my favorites because of how loose I was with the design while staying true to the character. Except for that cigar... I'm not sure where that came from. These four were all done using a direct-on-tablet style that I was attempting to refine, but couldn't quite nail until recently when I revived my Super Smash Bros. project. The most basic of the four I had completed. There's... not much else to say on this one! Another basic one, but I like the way it came out as I think FireMan is a little trickier to draw. I always like showing off my fire and other elemental techniques, too. 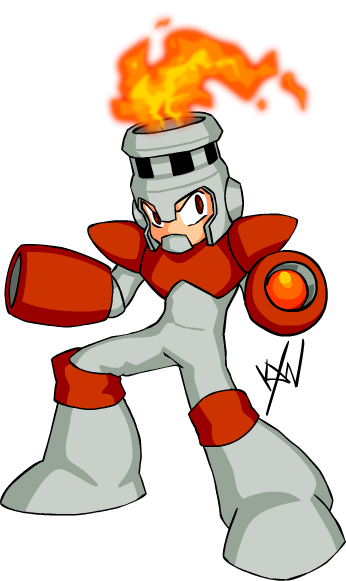 The last in the very brief Robot Master project previously mentioned. Definitely my favorite. Influenced by my good friends' Bill Cass and Al Orozco and their animated short; "HEY! Let's Get 'Em: Bowler Cap Chaps For Hire! ", which I did a very small amount of inking for. 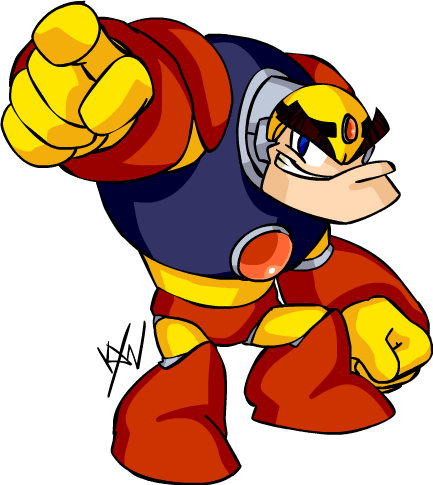 As a fun fact, I had started OilMan next, who was taking the route of being stylized as a Sonic the Hedgehog character. Fan art requested by my good friend Al of his character Mika Takahara from his series MOBiLE. 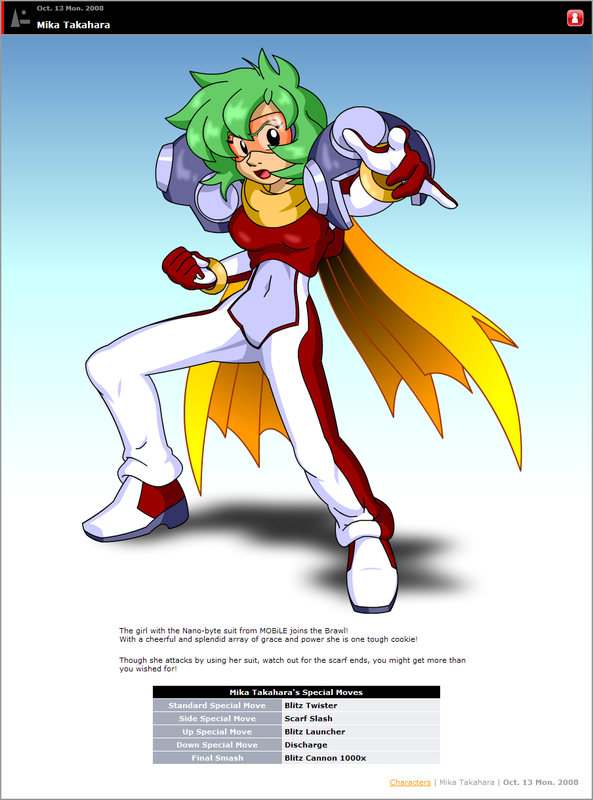 Rendered as a participant of Super Smash Bros., I took it as far as to mock it up in her own blog panel spoofing the official site, complete with biography and moves from Al himself. Mika Takahara and MOBiLE are © Al Orozco. 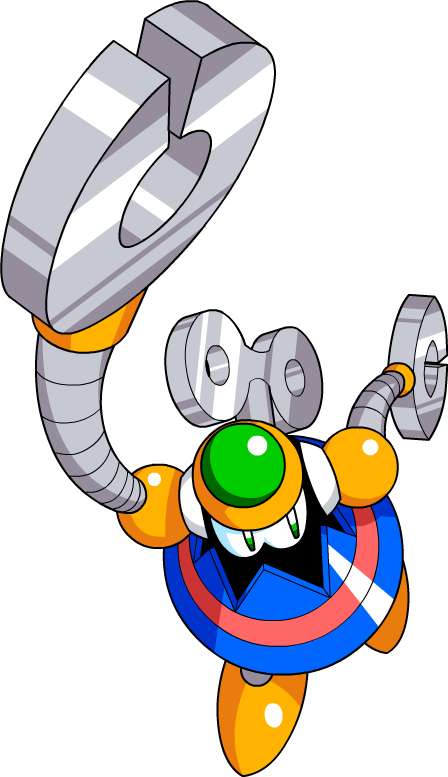 "Official artwork" of an enemy from Mega Man 8 and Rockman & Forte, done since it didn't otherwise exist. 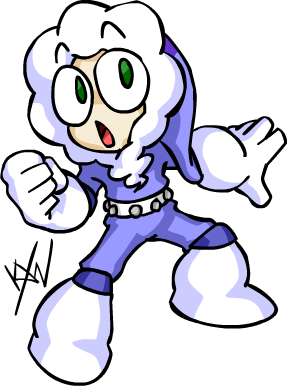 Influenced by existing Mega Man 8 enemy artwork. 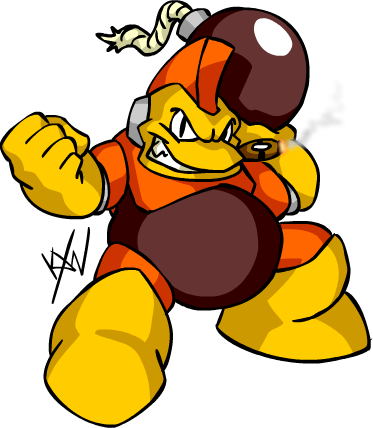 Actually the piece I refined my new methods of digital art on before I got into Super Smash Bros. "Round Two". 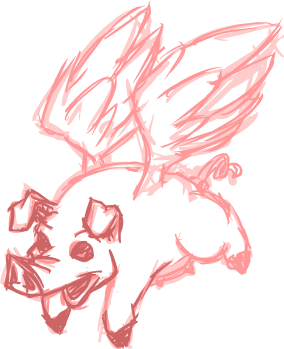 A quick scribble of a flying pig I did up as a joke for a friend. His wings are a little sloppy, but I'm pleased with his face and expression. Something to note is this is how most of my in-progress publishes look these days, for those of you interested in the behind-the-scenes aspect of things.